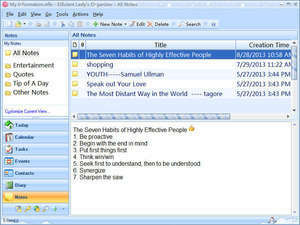 Efficient Lady's Organizer Free is a Windows personal organizer software program designed especially for women. Behind the stunningly fashionable interface is a software powerhouse that combines a calendar, contact manager, planner, reminder, diary, notepad, and password manager. this software download allows you to keep track of your appointments, tasks and birthdays by alerting you with a discrete popup window. Whether you're a businesswoman who needs to maintain a full calendar and appointment schedule, a student who requires an efficient way to manage your classes and social life, or a home PC user who wants a simple and easily navigable information manager for the entire family, Efficient Lady's Organizer has the tools that you need. Version 5.50.544 is a freeware program which does not have restrictions and it's free so it doesn't cost anything. For security reasons, you should also check out the Efficient Lady's Organizer Free download at LO4D.com which includes virus and malware tests. Additional screenshots of this application download may be available, too.